Dr. Armstrong has a special interest in children's health, and received additional training on the Pediatrics Speciality Shift during her internship at the Robert Schad Naturopathic Clinic in Toronto, Ontario. As a child, she was raised in a family where healthy living was of utmost importance, and she is passionate about helping children have a healthy start in life. Dr. Armstrong works closely with parents to provide education on how to raise healthy children, starting with pre-conception care and a healthy pregnancy. Dr. Armstrong enjoys working directly with children to help them feel comfortable and safe in the doctor's office, and she believes that each visit to the doctor should be educational and enjoyable. Dr. Armstrong helps children feel comfortable in her office by engaging with them during the appointment while also keeping their parents involved. 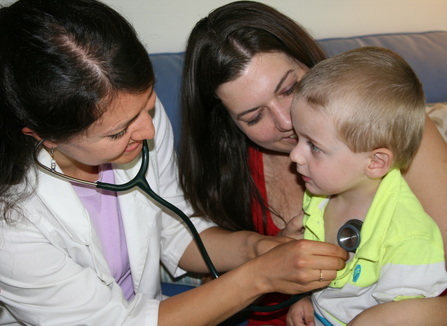 What can Naturopathic Medicine do for children? Dr. Armstrong works with parents to build a strong foundation of health for their children, starting with optimal nutrition for the whole family. Ensuring a wholesome diet and removal of food sensitivities is an essential first step towards proper digestion and utilization of key nutrients. Dr. Armstrong will work with you and your child to optimize healthy physical, mental and emotional development. Where appropriate, additional therapies such as herbal medicine, supplements, homeopathy and lifestyle counselling are used to address common pediatric concerns. In addition to children's care, Dr. Armstrong offers pre-conception and pregnancy care, as these are opportune times to positively influence early growth and development. To book an appointment for yourself or your child, contact Dr. Armstrong. Why is this stage of life so important? The most rapid human development occurs during childhood and adolescence. This is the time when our immune system lays down its foundation, our bones acquire much of their density, many of our psychological beliefs and thought patterns form, and so forth. This time of life offers an extraordinary amount of opportunity to set the foundation for children to grow into physically, mentally and emotionally healthy adults. What are some common conditions you see among infants, children and adolescents? 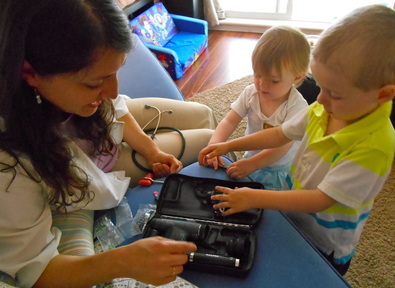 To facilitate a calm environment before beginning a physical exam, Dr. Armstrong teaches her young patients what her medical equipment is for and how she will use it.